KARACHI: Acting President Mian Raza Rabbani Friday said that palying foreign leading footballers in Pakistan would portray her positive image in the world. He said football was the popular game of the poor, hardworking and those who lived in slum areas of the country. Addressing the Leisure Leagues’ final player ceremony here at a hotel, Raza Rabbani said when the world would see that leading players from around the globe were coming here to play football game not only in Karachi but also in Lahore, Quetta and Peshawar that would put a good impact on the image of the country. He said that Pakistan was second to none in the filed of football and hockey games. The arrival of football sport in the country would be a good omen in the current circumstances. When football would thrive in the country then it would introduce a new paradigm, he added. Razza Rabbani referring to the law and order situation, said Pakistan was faced with the menace of terrorism and sectarianism. The nation along with army and law enforcement agencies were fighting against terrorism, he added. The Sindh Minister for Information, speaking on the occasion, said holding of the event would be an image changer initiave like the China-Pakistan Economic Corridor (CPEC) that was the game changer in the economy of the country. He gave assurance to the Leisure Leagues and World Group Trunkwala’s for their cooperation for the provision of football grounds and other facilities by Sindh governemnt. On the occasion, former President and Prime Minister Mohammed Mian Soomro during vote of thanks said that with prays of all, the event will bear fruit. 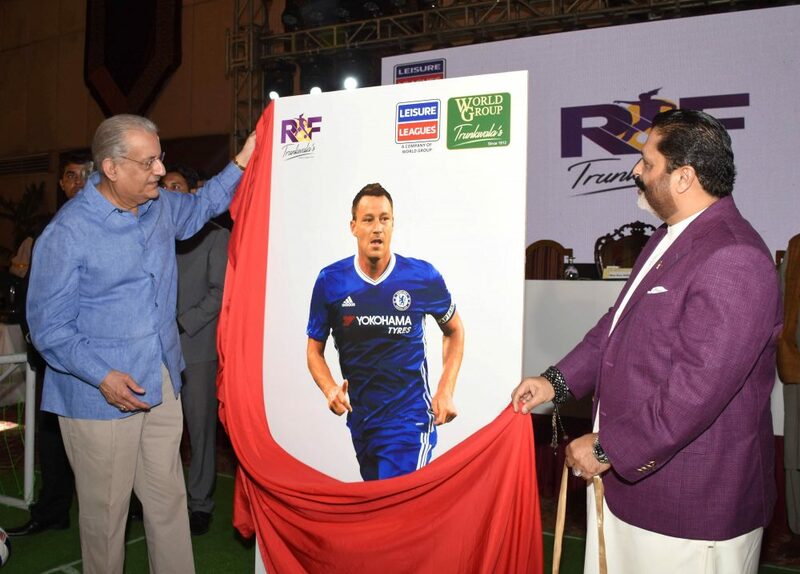 In the end, the Acting President unveiled the photo of final player legend John Terry, the Chelsea Captain. Earlier, World Group President Shahzeb Mehmood Trunkwala announced the coveted line up of international players in the Ronaldinho and Friends squad coming to Pakistan in summer this year to play an exhibition match under Leisure Leagues, led by the former Chelsea legend John Terry. John Terry is one of the most decorated players in football history. In his role as the England and Chelsea Captain, he has 5 Premiere League Titles, 4 FA Cup Titles, 1 Champions Leagues Title and 1 UEFA Europe League title to his name. UK’s largest amateur football league, Leisure Leagues, a company of World Group (Trunkwala’s), has announced a long term plan for all football enthusiasts to be part of their 5, 6 and 7-a-side football matches in Pakistan. Leisure Leagues Pakistan is a nationwide initiative of Trunkwala family to bring football in the country and create a platform for the local talent of Pakistan. Bringing international players of this stature to Pakistan is a step towards building the country’s image globally. At home, we want to empower our local talent and create a platform that gives every individual a chance to play football and groom their skills. The leagues would help players in Pakistan become international players, get scholarships in foreign varsities and placement opportunities abroad. “We want the youth of Pakistan to pursue their passion for football without any hardship and eventually to showcase their talents internationally, said Mehmood Trunkwala. COO Leisure Leagues Pakistan, Ishaq Shah said “Our aim is to ensure a nationwide platform for football players in Pakistan”.